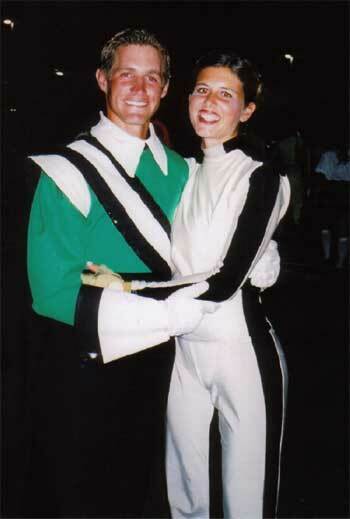 Christine Shirey, who marched with Bluecoats (2003-'04), and the Cadets (2005), sent in this one. "This is a picture taken after quarterfinals in the parking lot of my boyfriend Barry Janicula (lead trumpet Cavaliers) and I (Christine Shirey the Cadets color guard). "We caught a lot of stares, questions, harsh words, and jokes because of our Cadets/Cavaliers relationship. No one in either of our corps could understand how we could get along and be in love when we were battling against each other for the top spot almost every night on the field. "We met in drum corps, fell in love last summer on tour, and now have celebrated both our championships together. Even though some people tried to make it hard for us to be together, I couldn't have imagined the summer without him. Thank you DCI for bringing and keeping us together, and thank you Barry. I couldn't have made it without you. I will love you always, even if you are a Cavalier." Thanks Christine! E-mail your best shots from the summer to dave@dci.org along with where and when the photo was taken. Send some biographical information about yourself as well. We'll give you full credit. Also, let us know if you want your e-mail address included.